Remember when you were in grade school and everyone used to give each other Valentine’s Day cards? That was pretty cool, right? Here’s the thing about those grade school Valentine’s Day experiences: They were pretty cool because everyone was included. Inclusion makes people feel good, and people who feel good are usually nicer. Another thing about people who feel included: when they’re included in a yearbook, they’re more likely to buy it – because it is more relevant to them. By now, you know that TreeRing is all about making the yearbook more relevant to each member of the school community. So, we’re not going to talk about that here. What we are going to talk about, though, is using yearbook ads to show people that your yearbook is more inclusive (and therefore more relevant to them) before the yearbook is distributed. That way you’ll make people happier (and nicer) and see increased sales! Here are a few ideas on the types of campaigns you can run using content created by other people. As a reminder, if you’re ever looking for a resource full of yearbook ideas, we have you covered. If you are crowdsourcing photos for inclusion in your yearbook, look no further. Those user-submitted photos have more use than just being used to fill out event coverage in your yearbook; you have great material for personalized, relevant ads. Using the photos that are submitted to you for inclusion in the yearbook, you can begin an advertising campaign that shows off the events that will be included in the yearbook. You can take a “through your eyes” approach to this campaign, creating a variety of flyers for distribution throughout the school. 1) Sort your photos for a specific event (you’re probably doing this anyway, for your yearbook layout). 2) Identify the group of photos you’ll be using in the yearbook. 3) If there are photos left over, sort them into a group so you don’t lose them. 4) Create three or four different flyers that feature different images from the event, showing off the various perspectives you’ve collected. 5) Write copy for the flyers that indicate the variety of perspectives will be shown off in the yearbook. 6) Provide clear instructions on how to purchase the yearbook. This type of campaign helps give everyone a feeling of “ownership” in the yearbook, letting each person with a photo featured that they’re contributing to a better yearbook. Similar to using your crowdsourced photos for yearbook ads, you can also use the artwork you’ve recruited for possible use on your cover, as section headers and other design elements. Incorporating these designs into your ads keeps your marketing on “theme” with your yearbook and, simultaneously, create interest and collect input into how that artwork is going to be used in the actual yearbook. To do this, run a series of ads asking people to vote on how they think each piece should be used. If you take this approach, you can create a number of different posters: one set might feature a single piece of artwork per poster while another might feature all of them. Another might only feature a message about how to vote and where to see the posters. 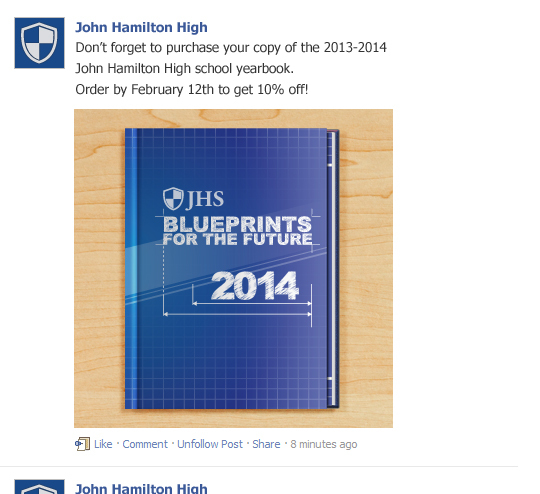 Of course, one of the big complaints we all hear from students about the yearbook is that they’re not actually in it. To combat this, pull together a series of flyers that highlights your school community. Your flyers should feature a collage of images, each showing off different groups of people. Make each flyer representative of the school, and write copy that conveys a message of inclusion. Did you just wrap up a particularly good-looking design for a particular section of the yearbook? Or a page that’s always sure to be a hit? Use those pages – or parts of those pages – to “tease” your audience and increase interest in your finished product. These pages can highlight certain parts of the yearbook or be a collage of various pages. You can make these pages timely (For instance: You won’t have your football spread done by the end of the season, but if there is a banquet in the spring, run a flyer featuring your spread then.) or you can run the campaign with a “Remember When” theme. Combining crowdsourced photos, submitted artwork and completed page designs to market your yearbook during the second half of the year takes your marketing to a whole new level. You’ll be attracting attention because of the fresh look you are presenting while also showing off the features and components you’ve been talking about to the school community. So, this Valentine’s Day, remember: You can make your life easier and make everyone in your school community feel good, nice and more interested in the yearbook by repurposing crowdsourced materials for yearbook ads.